Every day, customers come to me: “where are your sweet reds? Whites? Pinks?”, or “I’m a sweet person”, or worse, “I’m a dry person.” Really? Well, I have a lotion for that. Asking for only sweet or dry wine shortcuts disappointment: the disappointment of confusion, the disappointment of something new. We don’t like surprises. It’s in our genes. Otherwise, sabertooth tigers would have eaten our lazy butts long ago. So we construct our identity around our likes and dislikes. This dualist thinking is a shorthand survival tactic for interacting with others. To fit in, we agree with our friends and parents, or we disagree to stand apart from them. Along the way, we create ourselves. Companies and politicians foster and funnel this individualism into increasingly dual camps, so they can anticipate and capture our purchase power (just look at those advertisements on your facebook page). The problem is when we stop. When our definitions for good and bad, sweet and dry fossilize, and, out of convenience or apathy, define us. No wine is completely sweet. That would be a bottle of sugar. Neither is today’s “dry” riesling completely dry. Yeasts starved before converting its last morsels of sucrose and glucose into alcohol. So it has .03% residual sugar. But I’ll be damned if I can taste it. And that’s part of today’s challenge. It’s very hard to tell if something is sweet (i.e. has sugar), or is just fruity. Ripe, tropical flavors can make a wine seem “sweet”, when there is nary a gram of sugar (think Californian merlot). Acidity and tannins can make it seem drier (think Port, which has oodles of sugar). To fix this, in wine-speak, we call a wine dry, off-dry, medium sweet, sweet, or luscious, according to the level of sugar in it relative to all other styles of wine. A wine might dry out your mouth but still be medium sweet. Or taste like fruit punch but still be only off-dry. So taste it. But separate things like fruit flavor, drying tannin, acidity, and actual sugary sweetness into different categories with their own levels. A wine’s actual sweetness level will become clear with practice. (That, or check the alcohol content. If it’s high, it might be dry. 12% is the starting point where most sugar has become alcohol. As the alcohol drops below 12%, residual sugar should get higher). 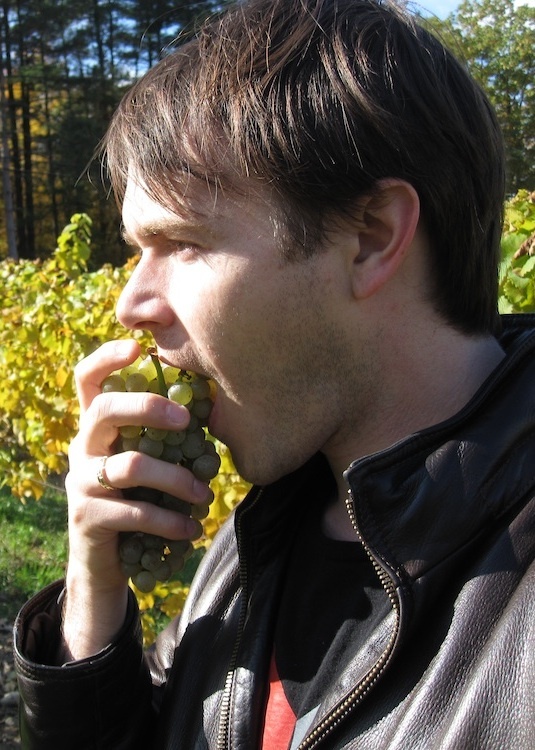 Now riesling is notorious for sweetness. But don’t blame the grape. Germany figured out that America and the world would buy sugared-up riesling, and we did (mainly because Coke and Welches had raised us). They continue to ship us that style in droves, each new wine generation buys it, which continues to brand our brains with the equation: riesling = sweet. Thing is, go to Germany (or any wine store worth its stuff) and you’ll find more dry riesling than not. Every winery has a range: from their most austere trocken to their desserty süß, because Germans drink before, during, and after dinner, outdoors and in, on hot days and cold, and buy each style according to context and preference. Riesling grows well there, so it has taken on, and defined, the many drinking demands of its public. Here, it is stuck in neutral. Don’t drink a wine because you like dry wines. Don’t drink riesling because it’s riesling. Don’t drink it because it’s local. Drink it to expand what you think is dry, what you think is riesling, and what you think is local. Never settle. It’s harder, but keep searching. You’ll drink more interesting stuff and keep redefining who you are. And if you really are a dry person, I have a lotion for that.